Oh dear, where did the last few months go? While this blog has been quiet I’ve been busy with travel, photos, climbing, and lots of different work projects going on. Clearly, I’ve got some catching up to do, so here is a quick start. Back in June I did a quick (maybe 10 day) trip down to Victoria. First stop Melbourne to present my show at the Annual General Meeting of the New Zealand Alpine Club; it was a small but appreciative audience and I really enjoyed the night. Next I blasted over to “The Garapiles” (The Grampians and Arapiles) –Â one of my favourites parts of the world — for six days of shooting. Always too long between drinks, there never seems to be an end to all the things that I want to shoot — let alone climb — down there. 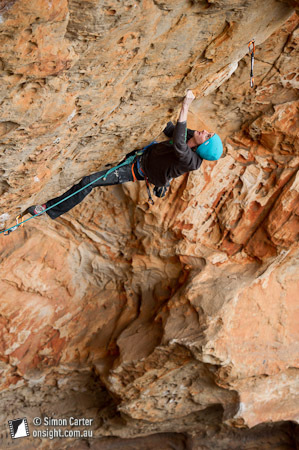 I spent a couple of days working on a photo project at Arapiles (more on that later) but the highlight for me was catching up with Dave Graham, Ian Dory (both from the USA) and Nalle Hukkataival (Finland) for a few days shooting in the Grampians. This was their second visit to Australia after a long trip out here last year. 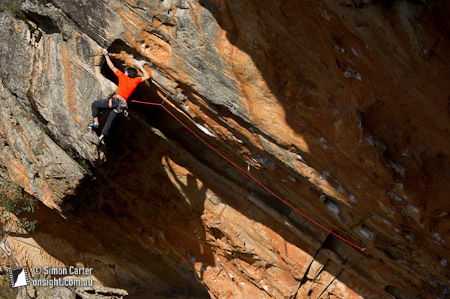 I always like hearing when foreign climbers get really psyched on Oz climbing and so I was keen to meet them and see what they were up to. Uber-strong climbers of course, no surprises there from what I knew, but also genuinely friendly, positive, open and down to earth, which I really appreciated. I really enjoyed my time with them and their friends Madeleine and Remy from Melbourne. And yep, on the rock they were crushing! Here are a few pics that I can show at this time. We started with a day at Muline Crag where Dave had sent Flower Power (33) second shot. 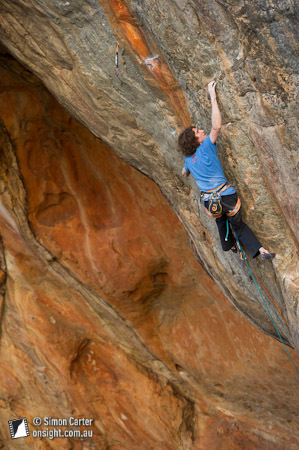 The route has been around for nine years yet I think Dave may have made only the second ascent. Dave on Flower Power (33) at Muline Crag. Ian sending Daemon Flower (31), Muline Crag. Then we spent a long day (and some of the night!) on the boulders at Buandik and they sent several new problems that day. 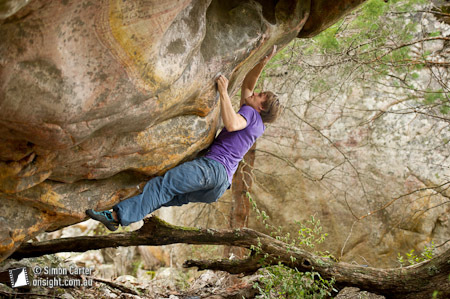 Nalle’s Knowing is Half the Battle (V11) is an insane high-ball — about 12-metres high! Both Dave and Ian stepped up and climbed it too. 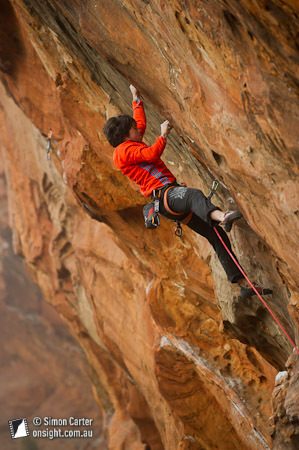 Nalle making the first ascent of Rootarted (V12), Buandik boulders. 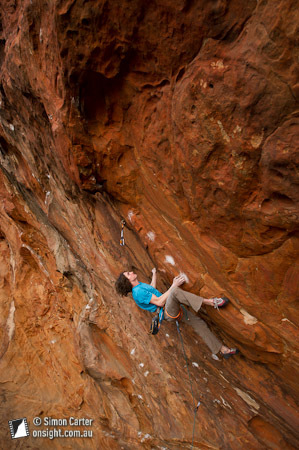 Ian attempting an unclimbed V14ish problem, Buandik boulders. 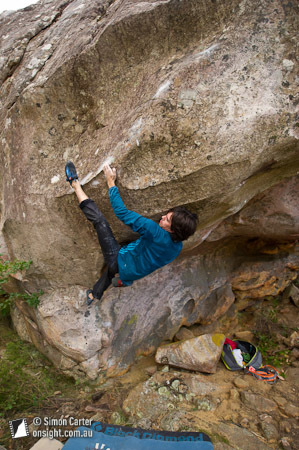 Nalle making the first ascent of the high-ball Knowing is Half The Battle (V11), Buandik boulders. 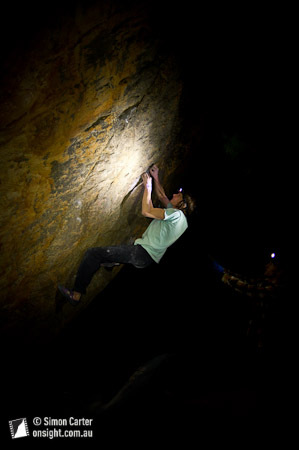 Dave keeping the motivation going long after dark to attempt Right Thurr (V13), Buandik boulders. And we had a beautiful afternoon up on the glorious orange rock of Millennium Caves, over-looking the Victoria Range. Ian onsighting the heroically (badly) bolted Nomads, Saints and Indians (29), Millennium Caves. Nalle climbing the boulder start to What’s an Aging Gigolo to Do (32), Millennium Caves. Dave working What’s an Aging Gigolo to Do (32), Millennium Caves. Dave flashing Breathing Gasoline (30), Millennium Caves. I headed home but the guys continued to have a productive trip.Â Both Dave and Ian climbed The Wheel of Life, the famously long boulder problem in the Hollow Mountain Cave. Dave said a route grade (of 9a+), rather than a boulder grade, was a more appropriate way to grade it given the style and length of the problem, errr, route. 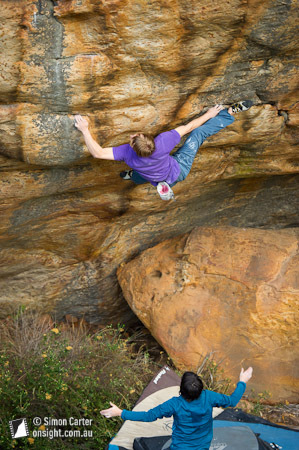 When finally the rain held off for long enough Dave sent the run-out Groove Train (33) classic on Taipan Wall. 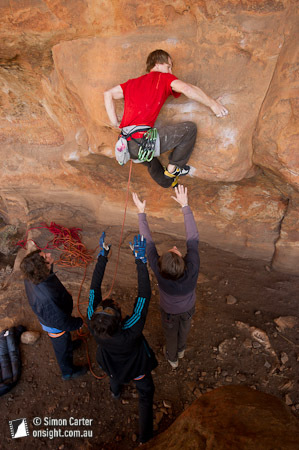 And at nearby Arapiles, Nalle established Never Say Never (V14), perhaps the hardest boulder problem at Arapiles. Still lots to do though, so I hope we’ll see them again next year. Busy times for Dave Graham, because in other news his new website project The Island has also just launched. With support from a lot of climbers and photographers it is going to be home to lot of really interesting climbing media. Be sure to check it out! Dave has a lot of really good ideas to build a positive online climbing community. I wish him well!